Women who catch a cold during pregnancy are more likely to have a child with asthma, research shows. It is known that allergy and asthma can develop in the womb since genetics play a factor in both diseases, but scientists set out to discover how a mother's environment during pregnancy can begin affecting her offspring before birth. The study, which analysed 513 pregnant women and their 526 children, identified an association between viral infections suffered by pregnant mothers and childhood asthma risk. It found the more colds and other infections a woman had, the more likely she was to give birth to a baby that developed asthma. Children were assessed at three and 12 months, and then every year until they reached the age of five. Nearly two-thirds (61%) of the families involved in the study had a parent that suffered from asthma, hay fever or eczema. For those who do suffer from the condition, asthma travel insurance is available for added peace of mind when taking family holidays. Pregnant women who are planning trips overseas are also reminded that specialist pregnancy travel insurance can be arranged. The researchers claim the findings, which are published in the journal Annals of Allergy, Asthma and Immunology, demonstrate how infections during pregnancy can alter the womb environment and affect a child's developing immune system. "Factors affecting the in-utero environment, such as maternal atopy (allergy) and infections, and bacterial exposure in pregnancy or early life, may act as immunomodulators enhancing or inhibiting the development of asthma or atopy in childhood," said lead author, Dr Sabina Illi from University Children's Hospital in Munich. Repeated common colds during pregnancy were found to more than double a child's risk of asthma at the age of five. Furthermore, women who suffered allergies when pregnant also increased the risk of eczema and rhinitis in their babies. Bacterial toxin in a child's mattress, meanwhile, did help reduce sensitisation to allergies and asthma risk by a small degree. 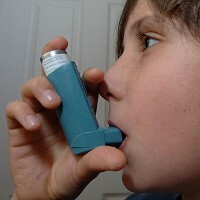 Asthma is a common long-term condition that can cause a sufferer to experience a cough, wheezing, and breathlessness.